Total Science Nutrition Creatine by Creapure® is the ultimate in creatine providing 100% pharmaceutical grade without any fillers or additives. Creapure® is ultra pure creatine monohydrate, made from non-animal-sourced raw materials which are synthesised using chemical reactions. It is tasteless and odorless so can be added to water, juice or your favourite shake, it is also suitable for vegetarians and vegans. Creatine monohydrate encourages muscle tissue to absorb water, creating the sought-after pump and promoting increased muscle growth by swelling the tissue. Creatine Monohydrate is easily broken down into ATP, the body's preferred form of fuel for intense exercises. It is also beneficial for your mental fitness including your brain and nerve cells. 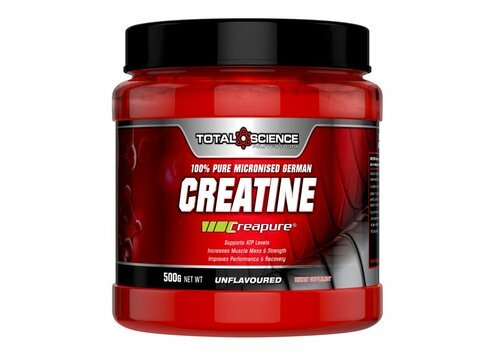 If you are serious about creatine supplementation, you need Total Science Creatine by Creapure®.